The new game from KONAMI has been released and it is free for everyone, PES CLUB MANAGER 1.2.1 APK is available and that is the latest version. Download it and install to your device if you want to play the game. After some time ago we are presented with the game manager full of action but minimal simulation in the Top 12, now comes a game of PES series that presents not only act but also a powerful simulation. Konami recently released game this game, which arguably is distant relative of PES Manager. Because the graphics and the gameplay is quite far away. This game also closely rival, if not surpass, Football Manager Handheld 2014, although it is still too early I stated. At least graphically provides realistic 3D action, not only dot. You can see the players directly and not engineered with repetitive movements such as the Top 12. Engine contained in PES 2015 (which personally I think is much better than 2014 version) is implemented in PES Club Manager. Each player movement actually generated from AI to follow the instructions of our tactics and the players ability. 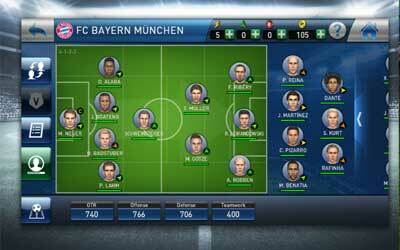 So roughly you will play the manager mode of PES 2015 on your mobile device, with adjustments of course. For gameplay and careers, you will be given a club that will fight from zero. You will name the club, the city, and the stadium, then took the emblem from other clubs licensed and determine nationalism of the club. After that, you will get player who has the ability bonus is high enough, like Danny Welbeck, Raheem Sterling, and others. The new player attribute skill “Special Trait” will add more depth to team strategy planning! The update will take some time, but we know you’ll enjoy this new feature. The new player attribute “Special Trait” lets you add a new ability to players! The color of the ball has been adjusted to be more visible. Very realistic game with many exciting features and different opportunities to influence the success of your team.